Three years ago we were puzzling over the many puzzles in Wilhelm Müller's Die Winterreise, not the least of them being the obscurity of poem 23 in the Schubert arrangement of the cycle, Die Nebensonnen. Schaut Andren doch in's Angesicht! I saw three suns in the sky and watched them long and fixedly; They too stayed fixed, as though they could not get away from me. Oh, you are not my suns! Go and stare in someone else's face. Yes, recently I too had three: now the best two have set. Now let the third one set after them! I'll feel better in the dark. We noted at the time that, although the sombre mood and heavy foreboding of the poem is clear to anyone, the metaphors and detailed meanings in this poem are difficult to resolve. We suggested then apropos Der Leiermann that Müller's poetry often attains the sort of oblique psychological intensity that we find in authors such as W. H. Auden. Let's not give up the interpretation task too easily, though. The resolution of the mysteries is a little bit easier if we can start the interpretation on the basis of some real, physical phenomenon. When, for example, Müller writes of 'crows' – well, we all know what those are. But what about his 'three suns'? Fortunately, the meteorological reality of a phenomenon that would account for Müller's 'three suns' is now well known. It appears that Müller's suns are based on observation, not imagination. In the Schubert world this idea was first mentioned by Harold Heiberg, 'a resident of Denton, Texas' in a note reprinted in Schubert durch die Brille: Mitteilungen 10, January 1993, p. 98. Harold Heiberg was born in North Minnesota and thus had first-hand experience of the extremely cold winters of that part of the USA. Brille rather snootily didn't give him his title, but he was a longstanding professor of music at the University of North Texas. Those were the days! Brille presented a small, smudged, black-and-white reproduction of a copy of a newspaper photograph of sun dog supplied by Professor Heiberg. These days, however, a very large proportion of the population of the world is permanently connected to a high-resolution digital camera of some sort or other and the modern web makes the reproduction of high-quality images a trivial exercise. 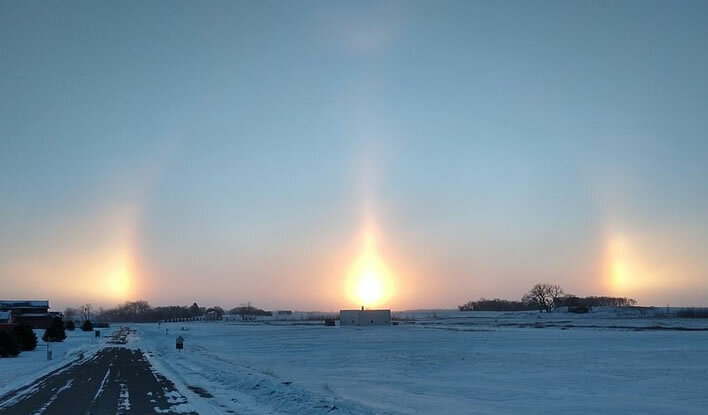 According to those who know about such things, in extremely cold winters, when the atmosphere contains no moisture but only tiny ice crystals, at low sun elevations the phenomenon known in English as 'sun dogs' can be seen. There are actually a number of phenomena that can occur together, all arising from the refraction of light through ice crystals. The most dominant effect is a halo subtending an arc of 22° centred on the sun. 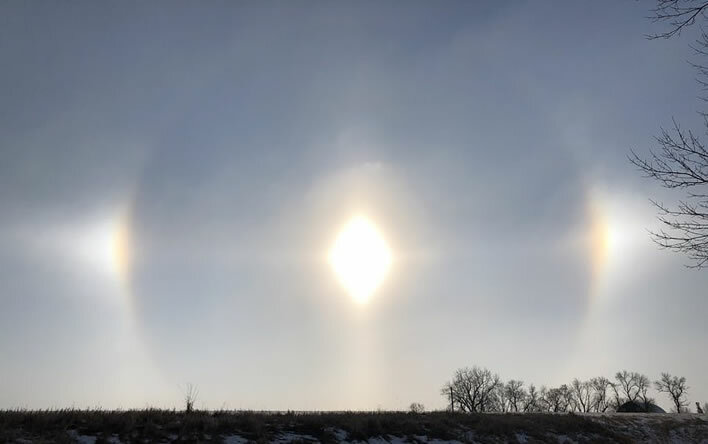 In addition to the halo, the presence of six-sided, 'platelet' ice crystals in high cirrus clouds can also lead to the appearance of two smaller bright spots on either side of the sun – these are the sun's 'dogs'. The geometry of the illusion is similar to that of a rainbow, with the difference that the ice crystals can be the shape of hexagonal plates (analogously to snowflakes), which tend to float flat in the air. The refracted light is thus concentrated in the horizontal plane through the centre of the sun and its halo, producing the two bright mini-suns on either side of the line of sight. At low sun elevations the dogs coincide with the 22° halo. As the sun rises they move apart and weaken, disappearing from sight at a sun elevation of about 40°. 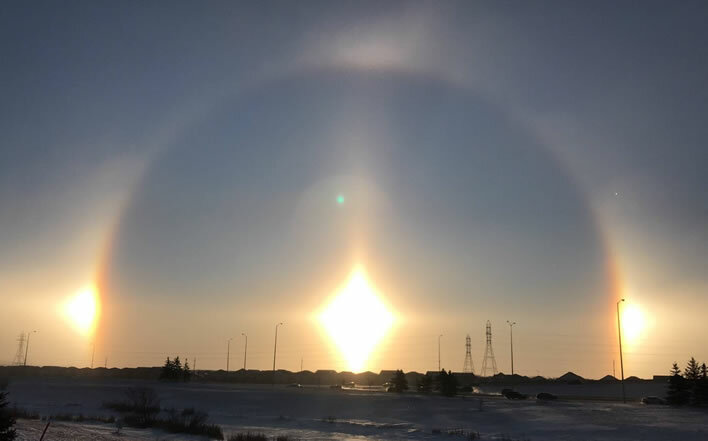 Just as in a rainbow, the refracted light is split into a spectrum – much less markedly than with a rainbow, though – producing a red cast on the inside edges of the two sun dogs. 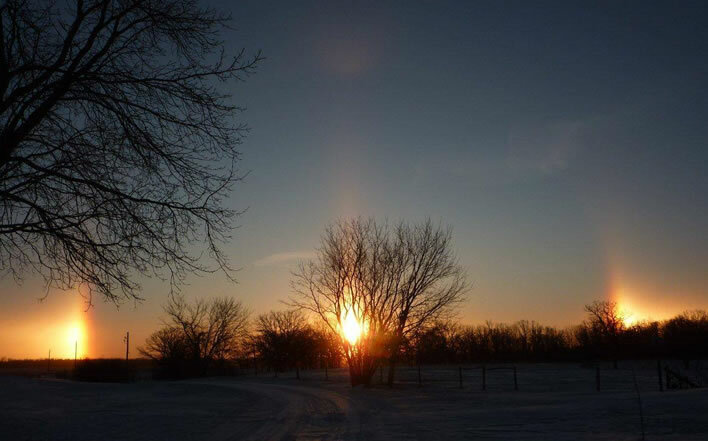 It seems reasonable to posit, as Professor Heiberg did, that Müller (1794-1827) had the opportunity in the cold of the hard winters in northern Germany to see his share of sun dogs. He spent a few years from 1813 in the Prussian army fighting Napoléon, so would have experienced many cold mornings in open country. From what we are told about the climate of the time, Europe (and probably the world) was starting to recover from what is now called the Little Ice Age. The few temperature records from Müller's lifetime show some unpleasantly cold winters. 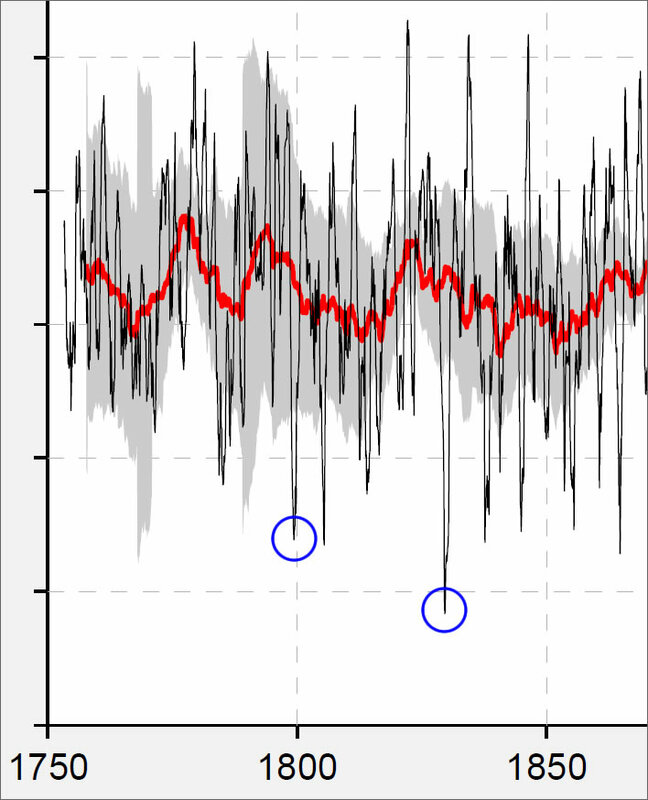 In the following chart of temperature anomalies, one circle marks the winter of 1798-99 (the cold winter that so beset Wordsworth and Coleridge in Germany) and the other the all-time coldest winters in the region according to Berkeley Earth, which occurred between 1828 and 1830. 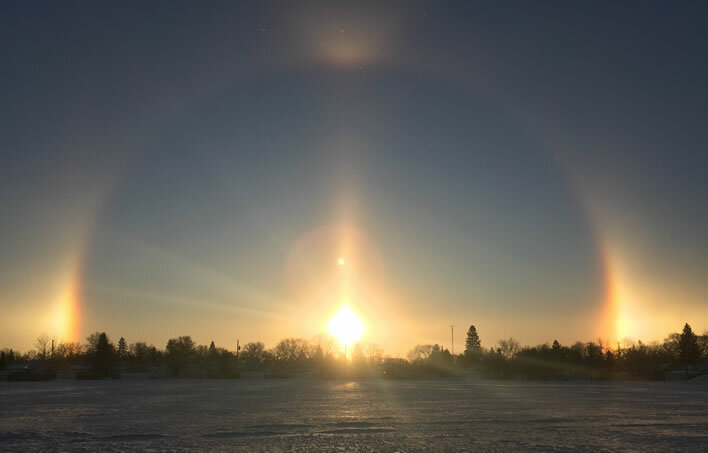 Furthermore, Müller's description of the behaviour of his 'three suns' corresponds with the physical reality of the sun dog phenomenon: the dogs will not move with the observer, but only track the sun as it rises. Just as with that other phenomenon, the rainbow, the sun dogs would appear to be fixed in the sky, sie … standen da so stier, 'they stood there so fixedly', since their position depends on the location of the observer and the angle of the rising sun. As the sun ascends the two dogs move apart and vanish. Müller, however, has them 'go down', Nun sind hinab die besten zwei, 'the best two have set'. It is at this point we enter the metaphorical fog of the rest of the poem. Whereas in 1993, on the basis of that smudged photo, the commentary in Brille on Professor Heiberg's suggestion was, to say the least, non-committal, given the modern photographic evidence it now seems perverse to dismiss the physical phenomenon as the starting point of Müller's meditations in Nebensonnen. Nearly all of the poems in Die Winterreise start with real-world observations that set time/season and place. This fact alone gives reason to suppose that Müller's Nebensonnen also began with a real-world observation that also set a very cold time and place: a sun dog event. The jump to the theological metaphors behind this phenomenon is then not a difficult one, particularly since at that time no one had any empirically-based explanation for this mysterious phenomenon. For most people it was just one more wonder in an age of wonders, one more message from on high.